Reading and understanding a dog food label is not as simple as it seems. Generic terms like "animal by-products" and "fish meal" are vague - what exactly do they contain? What kind of preservatives are being used in the dog food? What should we pay attention to when we are choosing dog food for our doggie companions? If you find it difficult to understand dog food labels, and are unsure as to exactly what to watch out for, read on ... 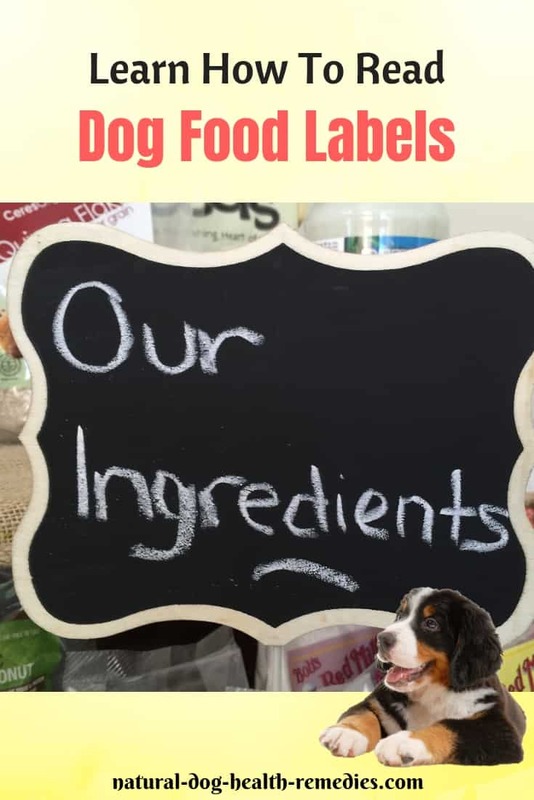 This page attempts to outline a simple way to show you how to read and understand dog food labels. If you are confident that you know how to read a dog food label, take this quiz to see how well you score! 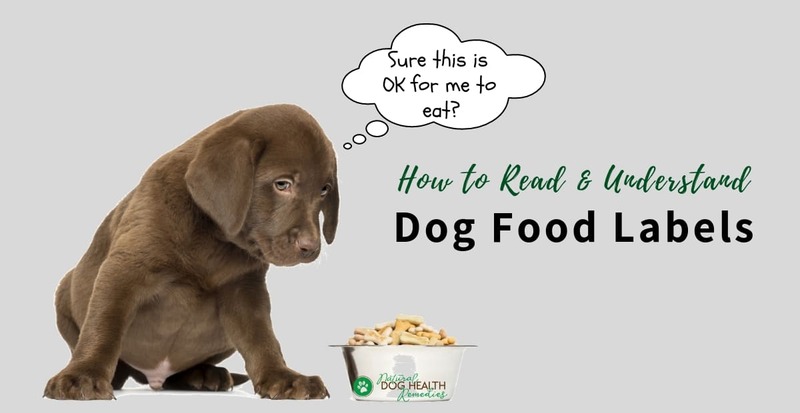 In evaluating a particular brand of dog food, we should check the dog food label carefully for the quality of the protein source, the amount of grain by-products, and any artificial ingredients such as preservatives, colors, or flavors among other things. The ingredient listings are regulated by the Association of American Feed Control Officials (AAFCO). Ingredients in dog foods are listed on the dog food label in descending order (by weight). Therefore, theoretically, those ingredients listed at the beginning of the list are more plentiful than those listed toward the end. However, one thing to bear in mind is, even if a kind of meat (e.g. turkey) is listed as the first ingredient on a label, it does not necessarily mean that the main bulk of that dog food is turkey. Why? Because meat contains about 80% water and is therefore heavy. When the water is removed from meat during processing, the weight of the meat is greatly reduced (by about 80%). This means that in reality the bulk of the food is most likely coming from the 2nd, 3rd and 4th ingredients on the label. However, the meat (in this case, turkey) will still be listed as the 1st ingredient. The main source of protein for dog food should be meat, and the first 2-3 ingredients should be one or two specified kinds of meat (e.g. beef, chicken, turkey, lamb, etc.) and then specified kinds of meat meal (e.g chicken meal, lamb meal). (Meal is essentially dehydrated meat and organs and is a good source of protein and other nutrients). Avoid generic meat ingredients that do not specify the source, i.e. what kind of animal the meat is from (e.g. avoid "meat", "fish", "poultry", "liver"). Similarly, avoid generic "meal" such as "meat meal", "poultry meal", "fish meal", etc. In a lesser quality food, meat and poultry meals, by-product meals, and meat-and-bone meal are common ingredients which are from less desirable animal products such as slaughterhouse offal. Stay away from "by-products" such as "poultry by-products", "chicken by-products", "fish by-products", etc. These "by-products" very often include such useless and often harmful ingredients as feathers, hair, and other unidentified meat parts and fat that are not good nutrient sources. While the processing of meats and by-products for dog foods can destroy a great deal of the nutrients in the food, it does not necessarily destroy the hormones used to fatten livestock or increase milk production, or drugs such as antibiotics or the barbiturates used to euthanize animals. This is why foods that use organic and/or human-grade meat sources are the best choice. Fats and oils are needed in a dog's diet. They are essential for healthy skin and haircoat, as well as for proper brain development and other critical processes in the body. However, not all fats and oils are equal. Some are high in saturated fat and low in essential fatty acids like animal fats (e.g. lard, tallow). It is therefore important that we identify the main source of fats/oils in the dog food label. Look on the dog food label for specifically named fats and oils, such as salmon fish oil, flaxseed oil, sunflower oil, chicken fat, etc. Ideally the fats and oils should contain a high percentage of Omega-3, with a lower percentage of Omega-6 fatty acids. Avoid mineral oil and other non-specific sources of oils and fats, e.g. "poultry fat", "vegetable oil", "fish oil". The next ingredients should be vegetables, whole fruits, and a whole grain source such as brown rice. For grain-free formulas, potatoes are often used. Since dogs are not biologically made to eat and digest carbs like grains, many holistic vets now advocate grain-free dog foods. However, if you opt for a formula that contains grains, look for organic, whole, unprocessed grains (also listed as "ground" or in "meal" form) since they yield complex carbohydrates and are much more nutritious than grain fragments and flours. Examples of whole ground grains are oats, barley, rice, millet, etc. Avoid any dog food that contains corn. Corn is a filler with no nutrients for dogs and can cause allergies to some. Avoid also "fragments" such as rice flour, corn gluten meal, beet sugar, as well as any unspecified grain sources like "cereal food fines". These "fragments" are just fillers which contain no nutrients. All dog foods have to meet certain nutritional standards, so dog food manufacturers are required to add certain amounts of vitamins and minerals to the foods. Like any other ingredients, these can vary in quality and in how well the body can absorb them. Look for chelated or sequestered minerals (also labeled as chelates, proteinates, amino acid chelates or complexes, polysaccharide complexes). For vitamins, look for nonacidic, time released versions of vitamin C (labeled as ester C, calcium ascorbate, stabilized vitamin C or L-Ascorbyl-2-Polyphosphate), natural vitamin E (tocopherol, natural tocopherol) and natural sources of vitamin K (egg yolk, liver, oats, kelp, alfalfa). However, remember that some of these supplements may be lost before your dog eats the food due to oxidation. It is therefore advisable to give additional vitamins, minerals, and other natural supplements to your dog. Some preservatives are necessary to keep the natural foods from getting rancid. Look for natural preservatives such as mixed tocopherols (vitamin E), vitamin C (ascorbic acid), extracts of rosemary, sage, or clove. Avoid synthetic preservatives such as BHA, BHT, TBHQ, potassium sorbate, propylene glycol, propyl gallate, and ethoxyquin. High quality foods usualy get most of their flavor from the ingredients themselves, but natural seasonings and some spices are not a problem. Avoid foods with artificial flavor enhancers (such as phosphoric acid), any highly rendered products (e.g. digests of any kind), broth of unspecified origin (e.g. "meat broth"), and glandular meal. Dogs do not care what color their food is, so it is not necessary to add any colorings to the dog foods. Natural substances like caramel coloring or coloring agents made from carotenoids are harmless. Avoid any "numbered" colorings which are coal-tar derivative dyes, such as Blue No. 1 and 2, Red No. 3 and 40, Yellow No. 5 and 6. Also stay away from color preservatives like sodium nitrite. The following is a dog food label listing the ingredients of a famous brand of dog food. Will you feed this to your dog? Ground Whole Corn, Chicken By-Product Meal, Ground Wheat, Meat And Bone Meal, Animal Fat (Preserved With Bha/Bht), Wheat Flour, Lamb, Rice, Corn Gluten Meal, Natural Flavor, Salt, Potassium Chloride, Dicalcium Phosphate, Vegetable Oil (Source Of Linoleic Acid), Caramel Color, Dried Beet Pulp, Titanium Dioxide, Vitamins (Choline Chloride, Dl-Alpha Tocopherol Acetate [Source Of Vitamin E], L-Ascorbyl-2-Polyphosphate [Source Of Vitamin C*], Vitamin A Supplement, Thiamine Mononitrate [Vitamin B1], Biotin, D-Calcium Pantothenate, Riboflavin Supplement [Vitamin B2], Vitamin D3 Supplement, Vitamin B12 Supplement), Minerals (Zinc Sulfate, Zinc Proteinate, Copper Sulfate, Copper Proteinate, Manganese Proteinate, Potassium Iodide), Added FD and C And Lake Colors (Yellow 6, Yellow 5, Blue 2, Red 40). First, if you look at the main ingredients (the ingredients before and including the first oil/fat which is "animal fat"), you can see that there is no real chicken in the food, only "chicken by-product meal". Second, there are a couple of unspecified food sources ("meat and bone meal", "animal fat"). Worse yet, they use BHA/BHT as preservatives and ... look at the colorings (Yellow 6, Yellow 5, Blue 2, Red 40). Yuck! You may by now realize how important it is to carefully check a dog food label for quality ingredients. 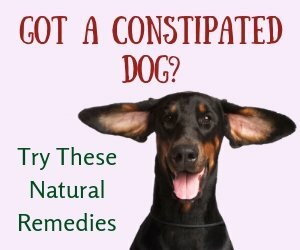 It is rather time-consuming to find natural dog foods that meet all the criteria listed above. However, it is worth the time and effort as natural dog foods can make a big difference in the health of your dog. Invest a bit of time now and you will be rewarded with a healthy beautiful dog that will be your companion for a longer period of time. 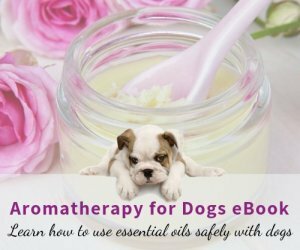 Please also visit this page for more information on important nutrient sources for dogs and ingredients that provide such sources. 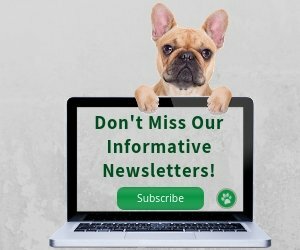 If your dog has food allergies, be sure to get more information on the topic here.